YEAH YOU DID IT! Your kids are great (and your husband), I’m so glad everybody was so supportive of you. 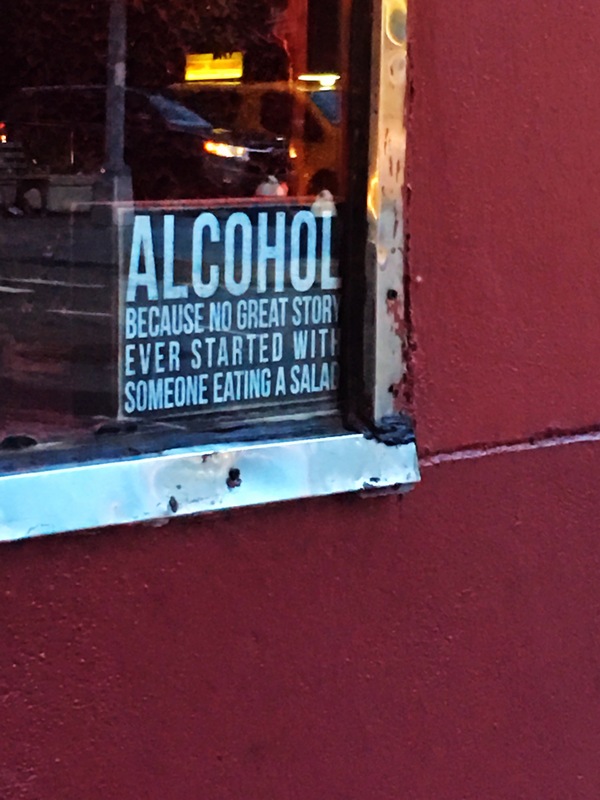 Though…I wonder now if I should use that sign as a writing prompt, and TRY to write a great story that starts with somebody eating a salad? No mics! One of the places is the local arts council, so most frequently, the people I know in the Writer Scene here outnumber the strangers. The other place was at the local bookstore for a festival thing, so no mic. That was a little more nervewracking, as several local “published by bigger houses” authors were there, but they were very complimentary after. So that was nice! I love that you know of and pursue these opportunities, that is fantastic! I’m not surprised to see you had good feedback 🙂 Sometimes I swear I can’t understand the line between published and not. Yesterday, I kept thinking about about how it would feel to step up to the mic and stand there, pages in hand, about to read from your own work in front of an audience of strangers. You didn’t have to, but you did, you took that chance, stepped out of your comfort zone and into the limelight and for those few minutes you OWNED it, to which I say, Bravo, woman. I’d not read your first chapter. Either I hadn’t found you or I was on holiday. Interesting. I can imagine it being read. Would sound good. Congratulations! How brave you all are to soldier on despite severe jitters. Stage fright has never been a problem for me. I’ve always love performing of any sort, but my friends who suffer tell me that it is simply awful. They don’t have strokes, but many of them do throw up before they go on stage – and sweat bullets. I don’t know if I could push through – proud to hear that you did! Bravo!!! I could never have done that! Well I am glad to read you have don’t it, great kids and a great husband is always a plus but you know that don’t you.